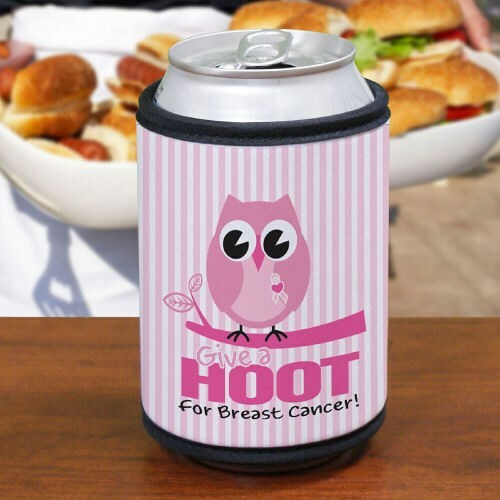 Keep your drink cool on warm summer days and spread breast cancer awareness with this Give a Hoot Can Wrap Koozie. Give one to each of your friends or family members who want to become an advocate in finding the cure. Your Breast Cancer Can Cooler Koozie is non-personalized and measures 4" x 9 1/2" with velcro closure around your beverage bottle or can. Shop MyWalkGear for all your Breast Cancer Gifts. MyWalkGear.com has a large selection of Personalized Breast Cancer Awareness Gift ideas that are perfect for Awareness Events. Get Personalized Breast Cancer Apparel for future Awareness walks and runs or give one of a kind Breast Cancer Keepsakes for encouragement and support for those fighting with this disease.